“Those were the days when people has to watch the satirical Comedy shows, spoof videos and sarcastic TV shows that will be aired every weekend”, one can say this now. Because, there is no less space for fun these days, let it be the grand new budget plan, let it be a serious speech by Rahul Gandhi, be it an allegation made by Arvind Kejriwal or may be Prime Minister Narendra Modi‘s new foreign trip. Every funniest thing is live, instant and viral these days. The boundless freedom social media gave us is quite a key to trigger comedy. Just like everyday, here there is a picture of the incumbent Prime Minister Narendra Modi Ji, which is going viral for the gait and the stature Modi posseses. 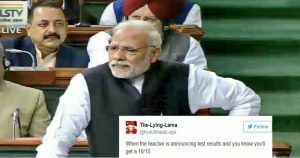 Earlier to this, Rahul Gandhi’s sensational version of ‘SCAM‘ won the Internet offering us various reasons to laugh in return trolling him to the tip and toe, later, Modi’s troll on Rahul Gandhi by relating the earthquake with Rahul’s creativity. What not, everything gains attention when it is viewed in a different way! Coming to this photo, here Modi Ji stands with a stern look, now observe it for little longer, you can find a teacher looking at you seriously for not doing your homework, or your Mom after finding you doing something very odd like bunking school. This little idea of switching thoughts is more than enough to generate a flood of trolls. then, there is no one that can stop the online space. These following tweets made by the crazy netizens can manipulate you to believe that what they are saying might be quite legit.